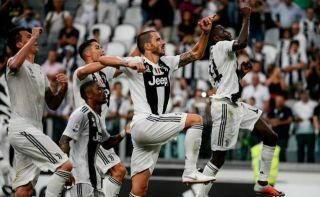 Juventus defender Leonardo Bonucci played no part against his former side AC Milan on Sunday night, and coach Massimiliano Allegri has revealed why. After returning to Turin this past summer having spent just one season with the Rossoneri, the 31-year-old has been a key figure so far this year having made 14 appearances in all competitions. However, Medhi Benatia was given the nod alongside Giorgio Chiellini on Sunday night at the San Siro, and Allegri has now explained his reasoning. “He already knew it yesterday,” he is quoted as saying by Calciomercato. “I wanted to let him rest because he played lots of games, he was more serene, he would be insulted … he had to stay out tonight”. The fact that Bonucci didn’t play wasn’t enough to spare him from jeers and chants from the home faithful, as seen in the video below when the Juventus squad was read out on the loudspeakers. Although the Italian international played a key role for Milan last season and certainly improved and became more influential as the campaign went on, he hasn’t been particularly complimentary since leaving and returning to Juventus. With that in mind, he was always going to get a negative reception from the fans, and so perhaps it was a sensible decision from Allegri to keep him out of the firing line and give him a rest. On the other hand, it could be argued that he shouldn’t have bowed to that pressure and played his strongest line-up. Nevertheless, perhaps tiredness was a genuine factor in his decision, while it ultimately didn’t matter as Juve got the result that they wanted with a 2-0 victory.